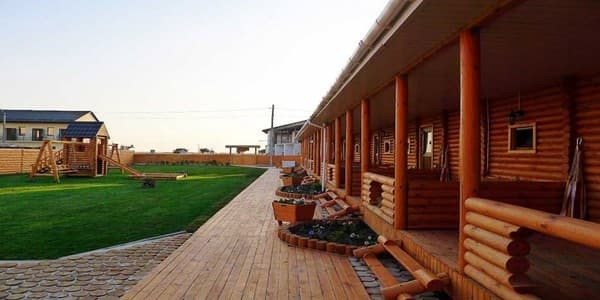 The hotel "Rancho" is located about 2.5 kilometers southeast of the village of Znamenskoe on the Belyaus spit stretching from the biggest salt lake of the Crimea to Donuzlav in the direction of Cape Tarkhankut. In the neighborhood of the hotel there are no noisy discos and restaurants. "Rancho" is an ideal place for family and children's recreation, located 500 meters from the beach with clean sea and white sand. The hotel is built from a wooden frame on a green lawned territory. Rooms of the hotel "Rancho" are 10 double rooms with the possibility of installing an additional single or bunk beds. A playpen is provided for small children. Each room is equipped with air conditioning, refrigerator, bathroom with shower, TV with satellite channels, kitchen for self-cooking. All rooms have Wi-Fi coverage with free access, access to the terrace with a hammock. 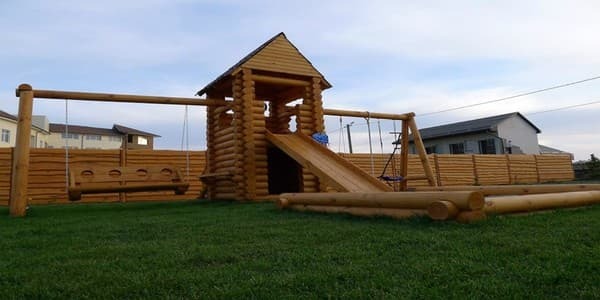 On site, there is free parking, a children's playground with an inflatable trampoline, swings and a sandbox, a gazebo for 20 people, free sports entertainment (table football, badminton, boccia, frisbee and more). Near the hotel there is a cafe. The distance to the village of Chernomorskoe is 15 km. PRICES MAY CHANGE, YOU NEED TO RECEIVE INFORMATION FROM THE OPERATOR! Description of the room: In a comfortable room of 30 square meters there is everything necessary for comfortable living: a double bed, a bedside table, a wardrobe. 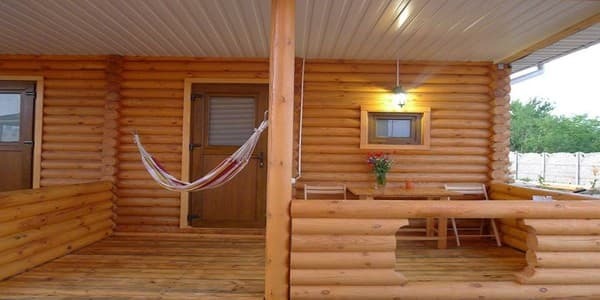 The room has access to its own terrace with a hammock. 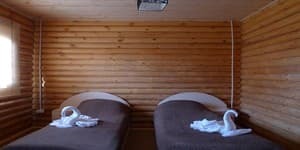 Description of the room: In a cozy room of 30 square meters there is everything necessary for comfortable living: two single beds, bedside table, wardrobe. The room has access to its own terrace with a hammock. Check arrival: from 10:00 - 11:00 hours. Check leaving: to 12:00 - 13:00 hours. Extra bed 50 UAH / day. The bunk bed is 100 UAH / day. The distance to the nearest bus station (Cernomorskoye settlement) is 15 km. Railway station - Evpatoria (65 km), Simferopol (130 km). Transfer is possible.